Questoverseas: How are you earning money for your gap year? Car washing, begging letters, long term loans from the parents, a combination of all of the above?! We hope the earning (and saving) is going well and want to help where we can. For example, one student came to see us today and was offered a place on one of our Villa Maria teams. She's hoping to earn her money working in a nearby shop, and is waiting to hear back from them shortly. So I hope it helps if she lets them know her gap year organiser is plugging them on our website. 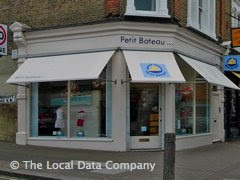 For all your baby shopping needs in South London, look no further than Petit Bateau on the Northcote Road, Clapham! How can they say no to you now!